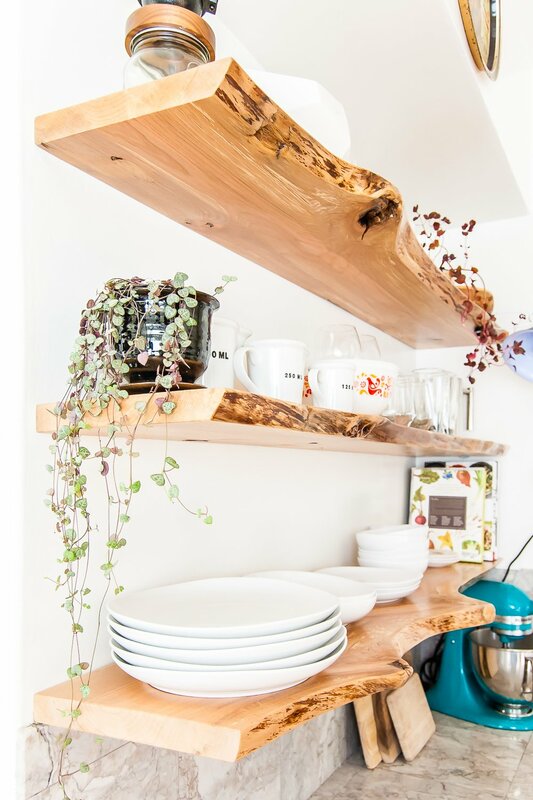 The biggest choice you need to make when you're thinking of building your own floating shelves is whether you want to use solid wood, or not. If you want to use solid boards, you'll probably need to buy hidden brackets. If you don't want to use solid wood, you'll be constructing wood brackets and hollow plywood boxes to go around them. Which you choose to do depends on the look you want and the available wood and tools. 1. Solid Wood Floating Shelves - Back when I wanted to hang my own live-edge floating shelves made from solid pieces of wood, I couldn't find instructions for how to do it. So I figured it out, and wrote my own tutorial. My shelves hold lots of dishes, and are just as solid as the day we put them up. 2. Chunky Floating Shelves - This is the most common way to build floating shelves, by constructing wood brackets and a box to go around them. It's best for shelves you plan to paint or stain. 3. Thin Floating Shelves - If you want floating shelves with a thinner profile, this tutorial shows you how to get that look. It uses the same techniques as the chunky version. I followed these instructions for building floating shelves in my breakfast nook, and they turned out great. I did use a few of the modifications mentioned in this post. 5. No Hardware Solid Wood Floating Shelves - Another technique for making solid wood floating shelves, this one doesn't require any store-bought shelf brackets. While I wouldn't pile it up with heavy dishes, this looks like a really clever way to make a light-duty shelf. 7. Rectangular Floating Corner Shelves - There's no reason your shelf has to take up a whole wall, thanks to this floating corner shelves tutorial via the gals at A Beautiful Mess. Clean, and effective. Share these ideas on Pinterest! Have you ever built your own floating shelves? What technique did you use? Want more decorating ideas? Check out 68 Apartment Decorating Ideas and Organization Tips for Renters.